This shot has a little something for everyone. It was taken in approximately 1920, during the construction of Canyon Road. On the left is Torger Peterson, County Commission, Ohop Pioneer and promoter of the Canyon Rd. 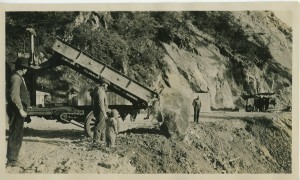 The older man and the young boy are noted as “McDowell and grandson”, both enjoying the big machinery moving large rocks.